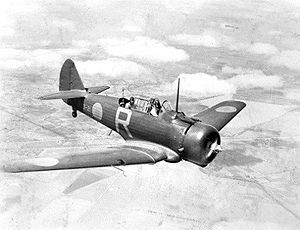 The Wirraway (Woiwurrung language: "challenge") was a training and general purpose military aircraft manufactured in Australia by the Commonwealth Aircraft Corporation (CAC) between 1939 and 1946. The aircraft was an Australian development of the North American NA-16 training aircraft. During World War II, the Wirraway saw action, in a makeshift light bomber/ground attack capacity, against Japanese forces. It was also the starting point for the design of an "emergency fighter", the CAC Boomerang. Three Royal Australian Air Force officers, led by Wing Commander Lawrence Wackett, were sent on an overseas evaluation mission in 1936 to select an aircraft type for local production in Australia. The aircraft selected was the North American NA-16. Production licences were obtained in 1937 and two NA-16s were purchased from North American Aviation to act as prototypes. These included an aircraft with fixed undercarriage designated NA-16-1A by North American (similar to the BT-9) and an aircraft with retractable undercarriage designated NA-16-2K by North American (similar to the BC-1). The NA-16-1A arrived in Australia in August 1937 and following assembly flew for the first time at Laverton on 3 September of that year, exactly two years before war was declared on Nazi Germany by the United Kingdom and France. The NA-16-2K arrived in Australia in September 1937 and likewise flew shortly afterwards. These aircraft were given the RAAF serials A20-1 and A20-2 within that organisation's numbering system. The NA-16-2K was the type selected for production. With several detail and structural changes, such as provision for two forward-firing guns instead of the NA-16's one, and strengthened structure to allow dive-bombing operations, the first CA-1 Wirraway, RAAF serial A20-3, made its maiden flight on 27 March 1939. This aircraft was kept by CAC for testing for several months and the first two Wirraways delivered to the RAAF were A20-4 and A20-5, on 10 July 1939. By the outbreak of World War II the RAAF had received a total of six Wirraways. Forty CA-1 Wirraways were built before the CA-3 entered production. Although there were detail changes to the design, the change in designation had more to do with the next batch of Wirraways being built to a different government contract than any real difference between the two sub-types. The CA-5, CA-7, CA-8 and CA-9 were all broadly similar to the CA-3 and it was only the CA-16 that had substantial design changes. These included wing modifications to allow a heavier bomb load and dive brakes for dive-bombing. Sets of 'dive bomber' wings (as fitted to the CA-16) were built under the designation of CA-10A (the CA-10 being a dive-bomber variant that was not built) and retrofitted to CA-3s, -5s, -7s and -9s; 113 Wirraways were converted. Seventeen Wirraways were modified post-war and delivered to the Royal Australian Navy (RAN), the modifications were incorporated under the CAC designation CA-20. The 17 included a CA-1, a CA-5 and numbers of all subsequent variants and operated under their RAAF serials. Production continued until after the end of World War II; CA-16 A20-757; the last of 755 Wirraways built, was delivered to the RAAF in July 1946. As its American "cousin" (both types having been derived from the NA-16) the T-6 did for many Allied Air Forces during WWII, the Wirraway served as one of the RAAF's main trainer types from 1939. The type made its last operational flight in 1959 after being gradually replaced by the new Winjeel trainer. Beside serving as a trainer aircraft they were also operated in combat roles, including as an emergency fighter. At the outbreak of the Pacific War in December 1941 Wirraways equipped seven RAAF squadrons: Nos 4, 5, 12, 22, 23, 24 and 25. A group of five Wirraways based at Kluang in Malaya for training purposes was pressed into combat against Japanese ground invasion forces; these were generally flown by New Zealanders with Australian observers, and had some successes. On 6 January 1942, Wirraways of No. 24 Squadron attempted to intercept Japanese seaplanes flying over New Britain; only one managed to engage an enemy aircraft, marking the first air-to-air combat between RAAF and Japanese forces. Two weeks later, eight 24 Squadron Wirraways defended the city of Rabaul from over 100 Japanese attacking bombers and fighters, resulting in the destruction or severe damage of all but two of the Australian aircraft. On 12 December that year, Pilot Officer J. S. Archer shot down a Japanese A6M Zero aircraft after he spotted it 1000 feet (about 300 metres) below him and dived on it, opening fire and sending the Zero hurtling into the sea. This was the only occasion that a Wirraway shot down another aircraft (and is one more than the total of aircraft shot down by its fighter offspring, the Boomerang). Fighter versions of the Wirraway operated over New Guinea for some time on ground attack and other Army co-operation tasks until other RAAF aircraft such as the Boomerang and American Curtiss P-40s were delivered to replace them. 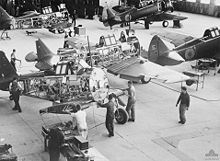 Many front-line squadrons of the RAAF had at least one Wirraway attached to serve as a squadron 'hack', a term used to describe aircraft employed on errands such as visits to headquarters or other bases. At least one aircraft (formerly A20-527) flew as part of Headquarters Flight 5th Air Force in full United States Army Air Forces markings. Post-war the Wirraway continued in RAAF service as a trainer at Uranquinty and Point Cook and was taken on strength by the newly-formed RAN Fleet Air Arm in 1948. Wirraways also served with the squadrons of the Citizen Air Force (a flying reserve force of the RAAF established in 1948) alongside CAC Mustangs, partially equipping No. 22 (City of Sydney), No. 23 (City of Brisbane), No. 24 (City of Adelaide) and No. 25 (City of Perth) Squadrons. The RAN retired its Wirraways in 1957, replacing them with de Havilland Vampires. After CAC Winjeels started to enter service, the RAAF commenced phasing out its Wirraways on 4 December 1958 with a farewell flypast held at Point Cook to mark its retirement from that base. The last military flight was on 27 April 1959 when CA-16 A20-686 was flown to Tocumwal for disposal. In 1954, Super Spread Aviation, based at Moorabbin Airport, bought two CA-16 Wirraways and modified them to perform aerial application operations. Both were almost brand-new, one having flown 9 hours and the other 12 hours; the modifications included the fitment of a hopper and spraying equipment. In a reflection of much of what was asked of the type during wartime, the two aircraft proved to be inadequate for the task and both were de-registered on 10 April 1956 and later scrapped. Despite the scrapping of these two aircraft and hundreds of others, a healthy number of Wirraways survive today, in aviation museums in Australia and in Papua New Guinea and with 10 on the Australian civil aircraft register in 2007; either flying or under restoration to fly as warbirds. A Wirraway being operated as a warbird crashed during an airshow at Nowra in 1999, killing the two occupants. CA-10 - Unbuilt bomber version. Gillison, Douglas (1962). Royal Australian Air Force 1939-1942. Australia in the War of 1939-1945. Series 3 - Air. Canberra: Australian War Memorial. http://www.awm.gov.au/histories/chapter.asp?volume=26. Retrieved 8 February 2009. Green, William. War Planes of the Second World War, Bombers, Volume Seven. London, Macdonald, 1967. ISBN 0-356-01477-0. Pentland, Geoffrey. Wirraway and Boomerang Markings. Dandenong VIC, Australia, Kookaburra Technical Publications, 1970. Profile Publications Research Staff. The Commonwealth Wirraway, Aircraft in Profile no.154. Leatherhead, Surrey, UK, 1967. Wilson, Stewart. Wirraway, Boomerang & CA-15 in Australian Service. Sydney, Aerospace, 1991. ISBN 0-958797-88-9. Zbiegniewski, Andre R. and Nowicki, Jacek. CAC Boomerang & CAC Wirraway, Wydawnicto Militaria 43 (in Polish). Warszawa, Wydawnicto Militaria, 1997. ISBN 83-86209-57-7.